What are the Defenses to an OUI Charge in Massachusetts When the Breath Test Result is .08? A common concern regarding OUI charges in Massachusetts involves the breath test and whether or not a result of .08 can be defended in court. 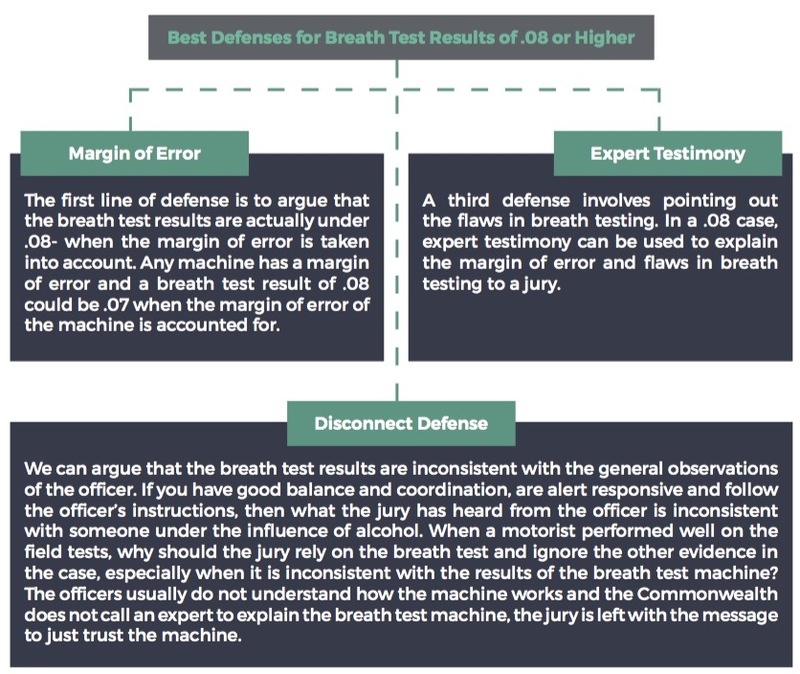 It might be pleasantly surprising to to learn that when your breath test results are .08 or .09, there are in fact many ways to defend the case. If you have questions about this diagram or about an OUI charge in Massachusetts, you can call me directly at 781-686-5924. It is normal to be concerned about the outcome of your case, especially when the breath test results are .08. But as you can see from the diagram above, you actually have many defenses and I would be happy to explain them to you further. You can also download my free book to learn more about Massachusetts OUI law. The client was charged with a First Of- fense OUI and submitted to a breath test with a .09 RESULT. Prior to trial, At- torney DelSignore was able to have the results excluded from evidence after an evidentiary hearing. The case proceed- ed to trial with the officer testifying that the client was speeding, had slurred speech, bloodshot eyes and failed field sobriety tests. After trial in Wrentham District Court, the client was found NOT GUILTY of OUI.